There are artists who have to wait until death to become famous, others are worshipped long before they even grow old. Such is the case of Salvador Dalí. Not only because of his surrealist paintings, his sculptures, his drawings. Not even for his multifaceted creativity in other areas like fashion, photography, theater or jewelry! Not just for that overwhelming legacy. He was also widely known for his eccentricity. And every eccentric carries his own cohort of detractors chewing on his bones and flesh like worms in a sort of symbiotic relationship. Relevant personalities and experts that get their moment of glory by feeding on crumbles left by the host and unknowingly magnifying his fame. Of course this is not always the case. But Dali and his genius, put a blemish on the bad reviews of all those who did not have the vision that only a gifted mind can give you. As talent always wins over mediocrity and shortsightedness. Dali the artist and Dali the star, altogether have evolved into a new parasite-proof living organism: Dali the icon. It is very hard to libel on icons. Once they reach the "divine" category your words may become heretical. 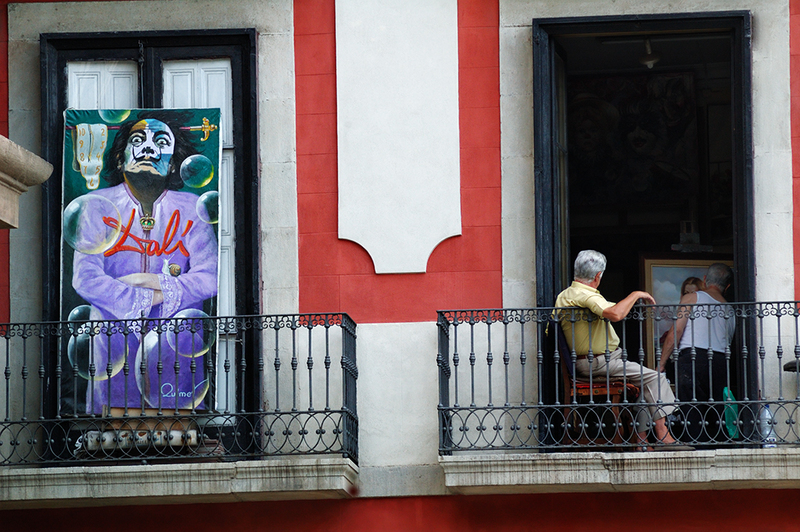 By the way, I almost forget, this balcony you probably have seen at the end of Las Ramblas, near Columbus monument. There was this man painting on canvas. First I thought the other guy was his model but the female figure on the painting clearly discarded him. I would like to know how much was that huge Dali painting to the left? Bidding is open. Unlike recent posts, in this one I am going to stick to the subject regarding suggested links. An icon is an icon and I don't want to sound apocryphal. Ladies and gentleman, welcome to the Salvador Dali Museum. Doesn't it look like the painter is doing his own take on the Mona Lisa? - Sure you will! Hmm I haven't seen mugs of Picasso, are there?